You've heard the saying "Once is happenstance. Twice is coincidence. The third time it's enemy action"? Well it looks like enemy action may be afoot, folks. Yet another Stand Your Ground state has claimed the life of an innocent young Black person as Renisha McBride was gunned down last Saturday in Michigan after she was involved in an auto accident and tried to seek help at a nearby neighbor's house. That neighbor opened the door and shot Renisha in the head. She died there on the porch. Two months ago a similar scenario happened to Jonathan Ferrell in the Stand Your Ground state of North Carolina. Jonathan, like Renisha, had just been involved in an auto accident and tried to seek help at a nearby neighbor's home. The neighbor called the police thinking Jonathan was an intruder and when the police showed up they tazed and then shot Jonathan 10 times until he was dead. Jonathan's story gained traction after it was discovered that he was a former football player for Florida A&M. 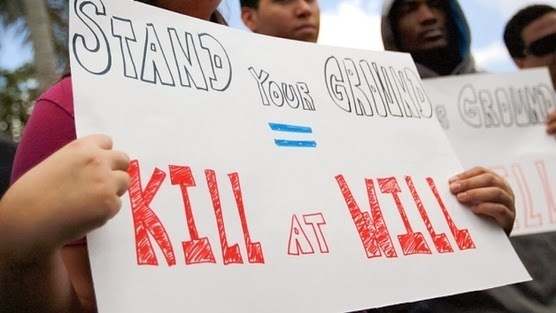 In theory, Stand Your Ground laws sound like a good idea. Indeed, they are often presented as a necessary means to allow innocent law abiding citizens to protect themselves from the ills of society. However, more and more we're seeing cases like Renisha's and Jonathan's (and don't forget Trayvon's) where innocent and unarmed Black people automatically trigger a "shoot first, ask questions later" mentality among gun owners. Instead of protecting innocent people, Stand Your Ground laws seem to be responsible for the deaths of innocent people. Especially at the hands of those who harbor racial prejudices. Whereas before, a midnight knock at the door might have ended with somebody being told to get lost, now it results in somebody being shot in the head. Thus, it is difficult to see how laws like these are taking us in the right direction as a society. If you are the type who doesn't particularly care for people of other races then that is your God given right to believe so. You can believe whatever you want. You can even go so far as to say just about whatever you want. This is, after all, America. Freedom of speech is enshrined within the First Amendment. But where I draw the line is when we, as a society, make it legal for people like you to DO whatever you want because then we have a problem. It's one thing to have a society that tolerates the verbal expressions of bigots and racists; it is an entirely different thing altogether to enable those same people to legally act upon their feelings towards others.